It is always a curious and odd little matter, to witness how even Buddhists become so obsessively attached to ‘sacred’ lands and in protecting them, commit acts seemingly prompted by hatred, delusion and ill-will. Ideally, lands should not become ‘sacred’ for simple reasons. The Buddha, in attacking the rigid and unethical caste-system during his time, placed great stress on the importance of deeds or action. That was why it was said (in the Vasala sutta) that one did not become a Brahman (or an outcast) by birth, but by deed. That wonderful message ought to have taught us a very valuable lesson, which, to rephrase the Buddha, could be stated as follows: that a land becomes a ‘sacred’ (or Buddhist) land not by anything else but only by the words and deeds of those inhabiting that land. Even a place of religious worship would lose its sacredness if, in the guise of religion, all manner of nefarious activities are carried out therein. In such cases, your virtuous neighbour’s backyard becomes more sacred than the ‘sacred’ land or place of worship. However, these are not ideal times and ideal societies. Laws and regulations can be enacted empowering ministers and other officials to declare a particular territorial area a sacred land. And of course, this is not a practice limited to Buddhists alone. 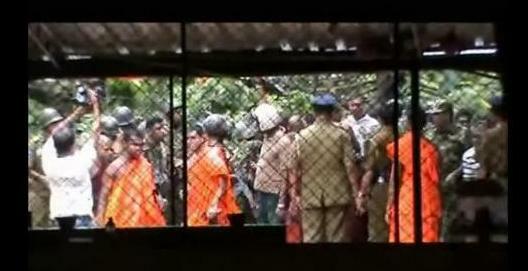 But when mob violence is seen to be propagated, as was done in Dambulla on the 20th of April – when a number of Buddhist monks and laymen stormed a mosque in Dambulla and demanded the dismantling of that mosque – we know, very well, that something is not quite right; not only in the ‘sacred’ land of Dambulla, but also in this supposedly Buddhist-country. The immediate concerns arising from the unfortunate vulgarity exhibited by some Buddhist monks and their lay followers have been already highlighted. In what was said by some of the protesting monks, there are the obvious traces of violence, racism, religious extremism and that burning desire, if necessary, to cleanse the territory concerned of the ‘other’ (the ‘other’, in this case, being the follower of the Islamic religion). How this plays out politically – domestically and internationally, both against the country and against Buddhism – is easy to understand. But there are other concerns too. Firstly, the demeanour of such monks – who seem to be going against some of the fundamental precepts of the Dhamma, one being indriya samvara sila (morality concerning sense-restraint), which is one form of sila or morality a monk (a bhikkhu) is expected to follow – contributes greatly to the doubt and skepticism that is generated in the minds of the lay Buddhist follower today. The sangha community (or the community of Buddhist monks) has been traditionally, and principally, looked upon as a community which guides the layman in the path of the Dhamma and morality. And given that it is the members of this community who ultimately preach and propagate the Dhamma and since they play the principal role of the ‘guardian’ of the Dhamma in the eyes of the ordinary layman (even though the politician is seen to be playing this role too), acts as were witnessed in Dambulla can have the obvious and natural effect of generating a great sense of doubt (vicikiccha) about, and ill-will (vyapada) towards all aspects concerning Buddhism, its fundamental teachings, the community of monks, etc. Doubt and ill-will are factors hindering the path to emancipation. Doubt, of course, can be eradicated through, for example, the knowledge of the Dhamma, confidence, discussion and questioning. But the question is: can a community of monks (of the Dambulla-type) be of any assistance to the layman in this regard when what one witnesses is a community of monks engaged even in, inter alia, ‘animism’? (as Dr. Laksiri Fernando put it, in ‘The government must apologize to the Muslim community’, The Island, 30 April 2012). Secondly, viewed from a critical legal perspective, the Dambulla incident throws up significant questions about the turn to law, by which I mean a turn towards the laws contained in statutes, ordinances and the like to resolve the Dambulla-incident. Now, resolving a dispute through the law is acceptable and if all parties agree to respect the verdict, the legal-approach naturally turns into a useful mode of dispute resolution. It will soften tensions, calm your nerves. But this legal-turn has its weaknesses too. By reducing this entire problem to a simple legal dispute, which the law books and laws will now resolve and one which then will be left in the hands of lawyers and judges, the legal profession can also act as a smokescreen which hides or shoves under the carpet some of the underlying moral and ethical concerns relating to the Dambulla-incident. The legal profession, under these circumstances, becomes a profession of irresponsibility, if some provision or the other decides the fate of the entire controversy. Laws, law books and judgments are (as we know) towards which fingers are pointed as a convenient excuse to evade moral responsibility for one’s words and actions: ‘Look, it is not my fault; it is that law, that judgment, which says so.’ Such legal formalism hinders political discussion and the resolution of political or other social problems and controversies through greater public participation and debate. The root causes go unaddressed, and they erupt in numerous other forms and manifestations elsewhere, some other day. And one such problem that law courts don’t discuss is one which is fundamental to the recent controversy: ‘political-Buddhism’ (a problem recently highlighted more specifically in the comments of veteran journalist and editor DBS Jeyaraj, appearing under some of the articles on Transcurrents/dbsjeyaraj.com). The Buddha, undoubtedly, is the most influential and admirable philosophical teacher I have come across. And, I do not view the Buddha very simply as one who had nice things to say about non-violence, peace and harmony, or as an extraordinary person who, from birth to death, carried out fantastic and unbelievable acts. But also, thanks to the excellent work of numerous Buddhist scholars (ranging from the likes of Ven. Walpola Rahula to Prof KN Jayatillaka, but more importantly, scholars such as Prof. David J. Kalupahana, et al.) I read the Buddha more as: a philosopher who, unlike any other, stressed the importance of understanding the concept of radical impermanence which runs through all our activities and lives (a concept which is far more complex than what is narrowly and inaccurately defined as one which means that ‘all things that are born end in death’); a critic who went against the traditions of his time and valued critical reflection and inquiry at all possible times (e.g. the Kalama sutta; also note the advice given to millionaire Upali when the latter expressed willingness to follow the Buddha: ‘Of a truth, Upali, make a thorough investigation’); a brilliant social reformer who made timely use of ideas and concepts that ordinary men and women believed in, to introduce the notion of morality as a counter response to the dangerous nihilism promoted during that time by the likes of Ajita Kesakambali (e.g. the Buddha’s deft use of the concept of ‘god’ to narrate the different destinies confronting human beings, stressed in a way that makes ordinary people believe in that concept and thereby are inevitably influenced to do good to reach the world of gods, devaloka); a master linguist who developed words to bring out the nuances of meaning which were not captured in the language during his time and which still baffle the traditional Eastern and Western mind (e.g. the coining of the term paccuppanna meaning ‘arisen with a background’, which expresses the meaning that the present is conditioned by the immediate past; which was in contrast to the strict manner in which ‘time’ was categorized during the Buddha’s day as belonging to the past, present and future, a categorization which did not make allowance for the complex and nuanced connection of the past and present, for instance); and a teacher who employed similes which had an extremely sarcastic bite, to drive home a point which could be somewhat discomforting to a traditional, conservative, mind (e.g. in explaining the futility of praying for salvation and the end of suffering, the Buddha tells Vasettha that such praying is similar in effect to a man who, having approached the river desiring to get to the other bank, calls out: ‘Come here, other bank, come here!’). But how, one may wonder, could this noble message of a profound philosophical teacher go so wrong in the hands of those preaching that teaching? The seeds lie in the very notion that the Buddha had advised his followers to be extremely mindful of: excessive attachment. From that springs all problems, and when that clashes with other ulterior objectives and motives of various groups (reasons pertaining to history, tradition, race, ethnicity, nationhood, politics, culture, ideology, etc. ), Buddhism ends up being another tool in the hands of the politically-motivated. Promoting Buddhism becomes political, and in the process, Buddhism ends up being another political language. Now, there is absolutely nothing wrong in the practice of preserving and promoting Buddhism. In fact, Buddhism should definitely be protected and promoted. What is problematic here, however, is the way in which it has been promoted and is sought to be promoted and preserved. The noble teaching of the Buddha becomes a problematic form of political-Buddhism when under the guise of promoting the teaching, various other ethnic, political and similar agendas begin to be nurtured and promoted to the detriment of those believing and following different other teachings or religions [This is perhaps the significant problem shared by those following Christianity and Islam, in particular. While all these teachings and religions are a great source of inspiration to the individual, they become extremely problematic when brought into the public realm of politics and governance where people respond differently to different teachings and faiths]. And more seriously, it is very easy and convenient for bigoted and narrow-minded followers with ulterior political motives to intentionally misinterpret and misunderstand the teachings if necessary. To take one example: in the case of Buddhism, it was once the late Ven. Soma Thero (a priest I admired, but critically) who pointed out that getting hold of the wrong end of the Dhamma could cause unimaginable disaster. For instance, wrongly interpreting the meaning of impermanence (anicca), suffering (dukkha) and no-self (anatma) could end up in promoting violence and terrorism – because if everything is impermanent, suffering and without a ‘self’, then causing harm to anyone doesn’t mean much! So, one can imagine how dangerous even these fundamental notions of Buddhism can become in the hands of those who are more interested in politicizing Buddhism. One: the suggestion has been made that the government needs to apologize for what happened (as usefully made by Dr. Laksiri Fernando, et al). This argument, in general terms, lays much of the blame squarely on the government for being responsible for creating the conditions for inter-religious disharmony. A different version of this ‘government-is-the-culprit’ form of argument has been also raised by those who would not agree with some of the views expressed by the above mentioned authors. So, for instance, even Janaka Perera usefully points out that the real culprits for the present crisis are successive governments and that in the present case, the “ball is now in the government’s court” (Janaka Perera, ‘Dambulla Crisis: Who are the Real Culprits’ in Sinhale Hot News, 3 May 2012). The suggestion, in principle, is a very valuable one. As regards the Dambulla incident, certain reports suggest that a politician is behind the instigation of the mob-attack; and if so, the government definitely should apologize. But, over-stressing the need of this demand for an apology from the government has the (unintended, but at times even intended) consequence of shifting the blame away from others who ought to be held equally responsible. The government becomes the main culprit, sometimes the only culprit, whereas others go unchecked. Two: the above form of critique of political-Buddhism and the politicization of any religion leads to the famous argument which demands for a secular state and secular constitution. It makes perfect logic to demand so, and in principle, is a demand that one who is seriously concerned about inter-religious harmony cannot easily dismiss. But one of the nagging problems concerning the demand for secularism (through legal and constitutional means in particular) is that it often has the effect of reducing a complex problem (concerning religion) to a matter that can be addressed through law. Principally, ‘secularism’, when viewed as a term representing a particular mindset, is an immensely difficult destination to reach. Generally, it calls for: an entire rethinking of the place of religion in life and society, its role in the matter of politics and governance, to what extent religion should be a guide in such matters, and more fundamentally, about how education of religion should be conducted from school-level upwards, etc. In the case of Sri Lanka to argue, for example, that Article 9 of the Constitution is what leads to religious fundamentalism is based on the inaccurate assumption that taking away the provision leads to a better, harmonious and peaceful society. And for the secular argument to be accepted by a majority of the people, it cannot be seen to be made by those who are rabid opponents of Buddhism and Buddhists; which, in other words, calls for a politics of persuasion which has to be undertaken from within. Three: one of the prominent initiatives undertaken by citizens nowadays, given the advancement of information technology, is the mode of online-petitions. A very useful and important recent initiative concerning the Dambulla mob attack was undertaken in the form of a petition titled ‘Not in our name’ (see http://notinournamesl.wordpress.com/2012/04/26/put-your-name-down-and-resist-violence/#comments“. It is yet another important way of expressing the thought that the kind of violence witnessed in Dambulla is not acceptable, is condemned, and is not undertaken in our name. This is, to reiterate, not only an immensely useful form of public protest but also one which has today gained much support. It has, most usefully, generated greater awareness of the incident. However, what is hoped in the case of such forms of protest is that one is not deluded into imagining that this form of protest could be very effective at the end of the day. While supporting such initiatives, one still needs to be quite skeptical about them. Firstly, it just could be the case that it is precisely this form of protest (online-petitions, etc) that those who instigate and promote religious extremism are comfortable with. And in a sense, the very form of online-protest carries the image of our helplessness in the face of such violence and extremism. Secondly, and perhaps more seriously, the problem with the ‘not-in-our-name’ kind of language is this: contrary to our imagination, the kind of mob attacks seen in Dambulla could be acts which are not carried out in our name in the first place. They may be acts carried out in the name of those who are anyway having very rigid and fixed views about the place of religion in politics. And given the polarization that exists in contemporary society (NGO – anti-NGO, peace activists-war mongers, anti-Buddhist – Sinhala-Buddhist, etc), it is generally understood that those who resort to such violence/silently approve of such violence (group A) and those who say such violence is not in their name (group B) are anyway not on the same page ideologically and politically. Politically, then, group B’s resistance in the present case doesn’t shock group A into adopting a markedly different attitude. In other words: group A has to be critiqued, first and foremost, from within. Common inadequacy: where are the monks? This then brings us to the principal question: who constitutes this group within group A? I believe this is none other than the sangha community: the community of Buddhist monks. In all of the above responses, what is essentially missing is the role of the Buddhist monk. At the end of the day, it needs to be reiterated – not once, twice but a hundred times if necessary – that it is the community of Buddhist monks which can most effectively and significantly end this madness that is being carried out by some in the name of Buddhism. When Buddhist monks are seen to be acting in the way they did, no amount of criticism can prove effective unless those from within that community itself come forward and respond adequately. And it is this glaring absence of a critical response from the community of Buddhist monks which has been the most unfortunate absence in the overall responses that followed. It is this that all of us (especially those who are admirers of the Buddhist philosophy) must perhaps resolve to remind the monks, lay followers, and ourselves, whenever possible. However, while not abandoning the forms of protest and critique so far adopted, it is also necessary to call for a further nuanced critique and also the adoption of a skeptical (not dismissive) approach to certain comforting arguments which are made concerning the matter of religious harmony in Sri Lanka. The two are inter-connected. Firstly, the kind of critique necessary is not that which pins the blame entirely on a single monk: in this case, Ven Inamaluwe Sumangala. Rather, it has to be pointed out that this is a problem not limited to the attitude of Ven. Sumangala alone but could be shared by many others in the sangha community who not only directly support him but also do so indirectly, by maintaining a studied silence (and that too, in the name of ‘tolerance’!). Secondly, one needs to be somewhat more skeptical (but not dismissive) of the ‘reservoir of goodwill’ argument that we often raise (see Javed Yusuf, ‘Dambulla: A challenge for all communities’, The Sunday Times, 29 April, 2012). While one can broadly agree with the sentiment expressed, our continued reference to this sentiment could even have the indirect effect of making us utterly complacent and even irresponsible. A probing examination should remind us that while Dambulla-type incidents are somewhat rare, the Dambulla-type mindset may be a more prevalent and rooted one, given the silence of many in the ‘Buddhist-camp’. In short, the critical intervention of monks in particular is quintessential if they are serious about protecting and preserving Buddhism (and not the grotesque and dangerous aspects of political Buddhism). This is their duty, their responsibility. And this critical intervention, to be sure, is not one which calls for the spewing of hatred and malice directed at monks by monks. Certainly not. As the monks would well know, one can condemn certain practices and policies without hatred or ill-will (ujjhana). Therefore, before people cry out that Buddhism is too serious a problem to be left in the hands of the contemporary Buddhist monks, or that Buddhism should be protected not from politicians but from Buddhist monks, it is necessary for the monks to come out more openly and critically in expressing their views about the incidents, attitudes, policies and practices that the Dambulla-incident represents. This is also a vital task that critical Buddhist scholars (far more than laymen and women like us) should be mindful about. But when witnessing the manner in which the words and teachings of the Buddha have been misused, I, perhaps like many others, tend to consider a different moment to have been the most poignant and moving in the entire life-time of the Buddha. That moment comes soon after the Buddha gains enlightenment, and just before Brahma Sahampathi invites the Buddha to preach the Dhamma. In this moment, the Buddha, with great compassion, wonders (quite unexpectedly, to our minds) as to whether he should or should not go out into the world and preach the Dhamma. It is this moment, this picture of the contemplating Buddha, which captures that poignancy. For, it is a moment when the Buddha, now surveying the world, realizes that the decision to go out and preach the Dhamma contains enormous risks and challenges, that there are many in the world who have a lot of dust in their eyes, that they are deluded by wrong concepts, ideas and beliefs. In other words, that moment contains the very fundamentals of the philosophy the Buddha thereafter preached: that element of radical impermanence; that blend of the good and the bad; the happiness and sadness that enwraps a single moment and event; the great opportunity that was before the Buddha on the one hand and the tremendous risks that very opportunity carried with it on the other; the incomparable message of freedom that now had to be spread, and the glaring possibility of a restriction of the freedom of others that very message of freedom, if improperly and wrongly understood, could bring to others. It was perhaps a moment in which the Buddha saw hundreds of men and women cross the metaphorical river with the aid of the raft named the Dhamma and put an end to their suffering, while a thousand others failed, and failed miserably, and in the process, did all manner of things to the raft, the river and all around them. To strive on with diligence is what is required. And those words contain a very valuable lesson to the socially-engaged monk, in particular, who is genuinely and sincerely interested in preserving and promoting the noble teachings of the Buddha. In the Anagatha Bhayani Sutta the Lord Buddha has warned against the future dangers that would be faced. He has in fact predicted that such dangers would arise due to the misbehaviour of the priesthood themselves. So the real danger to Buddhism lies within not without. “Monks, these five future dangers, unarisen at present, will arise in the future. Be alert to them and, being alert, work to get rid of them. Which five? “There will be, in the course of the future, monks desirous of fine robes. They, desirous of fine robes, will neglect the practice of wearing cast-off cloth; will neglect isolated forest and wilderness dwellings; will move to towns, cities, and royal capitals, taking up residence there. For the sake of a robe they will do many kinds of unseemly, inappropriate things. “This, monks, is the first future danger, unarisen at present, that will arise in the future. Be alert to it and, being alert, work to get rid of it. “Furthermore, in the course of the future there will be monks desirous of fine food. They, desirous of fine food, will neglect the practice of going for alms; will neglect isolated forest and wilderness dwellings; will move to towns, cities, and royal capitals, taking up residence there and searching out the tip-top tastes with the tip of the tongue. For the sake of food they will do many kinds of unseemly, inappropriate things. “This, monks, is the second future danger, unarisen at present, that will arise in the future. Be alert to it and, being alert, work to get rid of it. “Furthermore, in the course of the future there will be monks desirous of fine lodgings. They, desirous of fine lodgings, will neglect the practice of living in the wilds; will neglect isolated forest and wilderness dwellings; will move to towns, cities, and royal capitals, taking up residence there. For the sake of lodgings they will do many kinds of unseemly, inappropriate things. “This, monks, is the third future danger, unarisen at present, that will arise in the future. Be alert to it and, being alert, work to get rid of it. “Furthermore, in the course of the future there will be monks who will live in close association with nuns, female probationers, and female novices. As they interact with nuns, female probationers, and female novices, they can be expected either to lead the holy life dissatisfied or to fall into one of the grosser offenses, leaving the training, returning to a lower way of life. “This, monks, is the fourth future danger, unarisen at present, that will arise in the future. Be alert to it and, being alert, work to get rid of it. “This, monks, is the fifth future danger, unarisen at present, that will arise in the future. Be alert to it and, being alert, work to get rid of it. Excellent article….it is what exactly is happening at present….as many other things the Buddhism too is highly politicised….it is funny ……when Buddhist priest go on rampage the …king preach Dhamma……what we see, hear, do are all contrary to what Lord Buddha preached…where on earth the …kings deliver messages on matters of Religeous importance?.it is like Queen of England takes over the role of the POPE….. The country is on a very dangerous path and certainly moving towards dictatorship…..because it has come to a point that for one to FART..permission has to be obtained from the …king…. and it is a thrill of the…king. The deafening silence on Dambulla says it all….Ven Inamaluwe sumana Thero was not sleeping for 50 years..he knew very well the presence of the mosque whether in temple land or not……but why now he shout…..who instigated him.? Why it is reported that liquor manufacturer in Matale is behind……king has made a serious mistake as his party leader made in 1956….for cheap political reasons…to stay in power forever…..he has sidelined the JHU…..they are the conspirators….they have already made the country ungovernable and will certainly make this a hell hole……. What the…king needs Is WISDOM…..DAMN WISDOM….. The one thing the king lacks is WISDOM. The man has learned nothing from history and continues to pander to racists and the hardline buddhist clergy. The Tamils may have given the sinhala state 30 years of trouble but see what the muslims will do to the sinhala state if the Dambulla incident is repeated. An essay of such excellence that it belongs with those of Regi Siriwardene, Charles Abeysekara and HL Seneviratne on the subject, but takes the inquiry further, informed by the intellectual ethos and epistemology of the Buddha. I urge that it be immediately submitted for publication in an English language mainstream newspaper and translated by the author into Sinhala for an even more mainstream reading public. I know they exist, because one such scholar monk, Ven Mandawala Pannawansa thero, preached an excellent dhamma sermon at our Embassy at the multireligious event on Feb 4th, when the religious fundamentalists had boycotted me and my Mission in Paris, preceding and accompanying it with a vicious propaganda campaign in their publications. Kalana also makes the salient point about the need for an internal critique; a point I have repeatedly made about nationalism/patriotism. The religious fundamentalists are NOT speaking in the name of Group B anyway, so a critique that is not in the name of Buddhism must perforce be more representative of Group A than Group B, or there is a lack of fit between claim and content. Group A would simply, scornfully, say ‘we weren’t speaking or acting in your name anyway…who told you we were? We are acting in OUR name’. Readers must also be reminded of the disruptive agitation conducted against President Premadasa and the Kandalama hotel project by Ven Inamaluwe Sumangala in 1992. The differences between then and now were (i) that President Premadasa did not blink and (ii) cosmopolitan civil society did not support the President or oppose the monk, for their respective stands…! Premadasa was a pluralist-reformist dissident within Group A (but not a funded or faddish defector from it seeking upward social mobility), with hugely significant support from that group, but none–or almost none– from Group B supported him (just as the Left did not step up to support SWRD during the B-C pact). Susil Siriwardhana, Neville Jayaweera, Chanaka Amaratunga and I were among the few from Group B, or outside of Group A, who supported him, and experienced the social consequences, the mildest form of which was the query “why is someone like YOU supporting him?”. Thus the contemporary conjuncture, with its discontents, may be understood better if one brings to bear the Buddhist methodology of ’cause and effect’; of the cumulative effect of earlier actions/inactions. Meanwhile, Kalana may wish to reflect speculatively, on the very long term consequences of the destruction of the Abhayagiri vihara and its texts, as well as the dynamics that led to such destruction. I totally agree with Safa. There is indeed a problem with the way these monks are trained. A rampaging monk is an eye-sore. There is a problem with political monks. There is a structural problem. “That moment comes soon after the Buddha gains enlightenment, and just before Brahma Sahampathi invites the Buddha to preach the Dhamma. In other words, that moment contains the very fundamentals of the philosophy the Buddha thereafter preached: that element of radical impermanence; that blend of the good and the bad; the happiness and sadness that enwraps a single moment and event; the great opportunity that was before the Buddha on the one hand and the tremendous risks that very opportunity carried with it on the other; the incomparable message of freedom that now had to be spread, and the glaring possibility of a restriction of the freedom of others that very message of freedom, if improperly and wrongly understood, could bring to others.”- In Kalana Senaratne’s conclusion. A Saint’s/ Savant’s/ Philospher’s dilemma in the face of the human condition! Lord Buddha was cognicent of the immensity of the problems, but being the leader he was and convinced of the validity of his thoughts, went ahead to do what was right. His thoughts and words touched a chord among the people. When these words touched the right people, ready to receive the message- like Asoka and Gandhi- the results were magical. Unfortunately to most, Buddhism is a faith and a way of life- a habit, but not a stimulus to think and seek the truth. The essence of Buddhism that encourages one to think, meditate and be equinamous, rational,disciplined, and follow the middle-path, has not touched many. To others like the Dambulla monk it is a slogan and a political tool. To the politicians and some monks it is a cover for many a sin. Middleten Murray, after studying the Vatican in depth, concluded, “There was only one Christian and he was crucified”. This is applicable to other religions too! Thanks Kalana, for a profound essay. Safa has said it all with the Bhuddha’s own words,why we have taliban bhuddhism in srilanka.Just imagine the wisdom of bhuddha who was born 2500 years ago to predict it so perfectly.The einstein of that era.